A recent electronic and chemical analysis of a metal plate (one of six original plates) brought in 1843 to the Prophet Joseph Smith in Nauvoo, Illinois, appears to solve a previously unanswered question in Church history, helping to further evidence that the plate is what its producers later said it was﻿—a nineteenth-century attempt to lure Joseph Smith into making a translation of ancient-looking characters that had been etched into the plates. The other item was a letter written in 1879 by Wilbur Fugate (another of those present at the excavation of the plates) to an anti-Mormon in Salt Lake City.6 Fugate declared that the alleged discovery of the Kinderhook plates was “a HUMBUG, gotten up by Robert Wiley, Bridge Whitton and myself. … None of the nine persons who signed the certificate [a document included in the Times and Seasons article] knew the secret, except Wiley and I. How the one remaining plate got to Chicago is an interesting story in itself﻿—a story that is consistent with physical evidence (to be discussed later) that this plate is indeed one of the original Kinderhook plates brought to Nauvoo in 1843. The X-ray fluorescence test indicated that the plate was made of a true brass alloy of approximately 73 percent copper, 24 percent zinc, and lesser amounts of other metals. In addition, an examination of the small area of the plate that was ground and polished revealed a basically “clean” alloy﻿—that is, there were very few visible traces of impurities such as particles of slag and other debris that one might expect to find in metal of ancient manufacture. The plates were apparently in Nauvoo, then, from Saturday the 29th through Wednesday the 3rd﻿—a period of five days﻿—and were then taken away. Later, however, they were evidently returned to Nauvoo for a time, for by June 24 the Nauvoo Neighbor press had access to them and was thus able to produce facsimiles for the published broadside. A History of the Church entry for Sunday, May 7, says: “In the forenoon I [Joseph Smith] was visited by several gentlemen, concerning the plates that were dug out near Kinderhook.”14 Whether or not the plates were actually returned on that day﻿—or indeed, whether Joseph Smith himself ever had the plates again﻿—is uncertain. In any case, the translation for which hope had been expressed in the Times and Seasons did not appear. In a letter dated April 8, 1878, Wilbur Fugate recalled: “We understood Jo Smith said [the plates] would make a book of 1200 pages but he would not agree to translate them until they were sent to the Antiquarian society at Philadelphia, France, and England.” Furthermore, a review of other entries in Joseph Smith’s history indicate that he was occupied during the following weeks with mayoral duties, Church business, the Nauvoo Legion, and four different trips to neighboring cities; there is no indication of translating activities.15 Then on June 23, just one day before publication of the broadside that repeated the Saints’ hopeful expectation of an eventual translation, the Prophet was abducted by Missourians who tried to get him to Missouri for prosecution on charges of “treason.” He made it back to Nauvoo on June 30, but the habeas corpus proceedings took up more than two weeks of his time. It seems, then, that there was considerable talk about the plates in Nauvoo﻿—and apparently as much misinformation and hearsay was current among people as there was fact. Pratt heard of a discovery in Pike County; Clayton said Adams County. Clayton said that the find was made six feet underground; Pratt, fifteen. Elder Pratt spoke of a cement vase﻿—an item mentioned in no other account. Clayton mentioned a skeleton nine feet tall﻿—also unmentioned in any other account. Clayton said that the plates gave a history of an Egyptian; Pratt mentioned a Jaredite. The elements that these two accounts have in common suggest a basic jist to the hearsay stories circulating in Nauvoo and also that Joseph Smith with others saw and wondered about the nature of the material that had been brought to Nauvoo. But there is, obviously, leagues of difference between an actual translation of sacred records and a consideration of artifacts of uncertain origin﻿—the former requiring study, prayer, and revelation; the latter characterized perhaps by an examination for points of similarity, etc., in a setting where various suggestions are likely aired by those present and elaborated on as discussion continued. And the actual presence of William Clayton or Parley P. Pratt in any discussion on the topic with Joseph Smith is simply unknown. The central issue in the whole question of Joseph Smith’s involvement in the Kinderhook plate episode is that the expected “translation” did not appear. And this fact may well explain the characteristic that has made this hoax most interesting﻿—that it was never carried to completion. That the Kinderhook plates were not authentic artifacts is no longer in doubt; but if the plates were faked, why wasn’t the hoax revealed right away? It has been suggested that the whole Kinderhook plate incident was, as Wilbur Fugate said in his 1878 and 1879 letters, a heavy-handed, frontier-style “joke.” On the other hand, the conspirators’ objective might have been more pointed﻿—to produce a bogus set of plates and then reveal the hoax in a shower of ridicule after the Prophet made a purported “translation.” In either case, they were frustrated in their scheme because no translation ever appeared. In fact, there is no evidence that Joseph Smith ever concluded the plates were genuine, other than conflicting statements from members who hoped that a translation would come forth﻿—and in fact no evidence that the Prophet manifested real interest in the “discovery” after his initial viewing of the plates. The statement taken from William Clayton’s journal didn’t appear until September 1856 in Salt Lake City’s Deseret News. At that point, time itself had eroded away the opportunity for a hearty joke, if that were the hoaxers’ intent; and the absence of an actual translation in spite of the Clayton entry in the “History of Joseph Smith” could only have added to their frustrations﻿—assuming that the hoaxers even knew of the Deseret News account, which appeared thirteen years later and a thousand miles away. 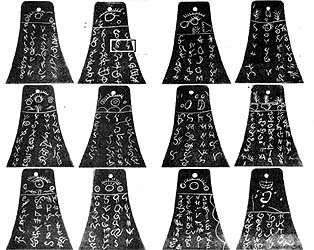 Another possible explanation for the hoax never having been carried through may lie in Robert Wiley’s desire to sell the plates as genuine artifacts. For him to have exposed the hoax before the attempted sale would, of course, have scuttled any negotiations; and to expose it afterward may have landed the sellers and conspirators in jail for attempted fraud﻿—turning the tables and making them the object of ridicule instead of Joseph Smith. Significantly, there is no evidence that the Prophet Joseph Smith ever took up the matter with the Lord, as he did when working with the Book of Mormon and the Book of Abraham. And this brings us to the other side of the story, for those of us who believe that Joseph Smith was the Lord’s prophet: Isn’t it natural to expect that he would be guided to understand that these plates were not of value as far as his mission was concerned? That other members may have been less judicious and not guided in the same way cannot be laid at the Prophet’s feet. Many people, now as well as then, have an appetite for hearsay and a hope for “easy evidence” to bolster or even substitute for personal spirituality and hard-won faith that comes from close familiarity with truth and communion with God. So it is that in the 100-year battle of straw men and straw arguments, Joseph Smith needs no defense﻿—he simply did not fall for the scheme. And with that understood, it is perhaps time that the Kinderhook plates be retired to the limbo of other famous faked antiquities. “Ancient Records,” Times and Seasons, 1 May 1843, pp. 185–87. The Times and Seasons was published twice monthly, dated on the first and fifteenth of the month, no matter what the date of its actual release. This issue, dated Monday, May 1, picked up a story from the Quincy Whig that was published on Wednesday, May 3. Obviously it couldn’t have been published before the Whig story appeared, and in fact the editorial subhead above the story on “Ancient Records” reads “CITY OF NAUVOO, WEDNESDAY, MAY 1, 1843.” So the Times and Seasons issue in question was printed no earlier than Wednesday, May 3, and possibly a day or so later. The full title is A Brief Account of the Discovery of the Brass Plates Recently Taken from a Mound in the Vicinity of Kinderhook, Pike County, Illinois. Available in the Library-Archives, the Historical Department, The Church of Jesus Christ of Latter-day Saints, Salt Lake City, Utah (hereafter referred to as Church Archives). The journal referred to is in private possession. Dr. James B. Allen of Brigham Young University used it by permission in connection with his research on William Clayton, and I wish to thank him for sharing this citation with me. Other volumes of William Clayton’s journals for other time periods have appeared in print﻿—see, e.g., James B. Allen and Thomas G. Alexander, eds., Manchester Mormons: The Journal of William Clayton, 1840 to 1842 (Santa Barbara and Salt Lake City: Peregrine Smith, 1974); William Clayton, William Clayton’s Journal: A Daily Record of the 1846 Journey of the Original Company of “Mormon” Pioneers from Nauvoo, Illinois, to the Valley of the Great Salt Lake (Salt Lake City: Clayton Family Association, 1921). History of The Church of Jesus Christ of Latter-day Saints, 7 vols. (Salt Lake City: Deseret Book Co., 1932–51), 5:372–79. Formerly widely known as the Documentary History of the Church. 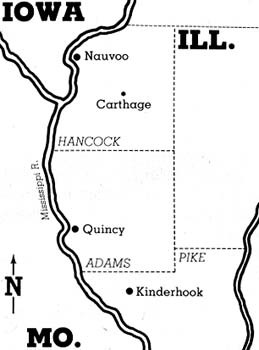 Printed in the Journal of the Illinois State Historical Society, 5 (July 1912), pp. 271–73. Wilbur Fugate, Mound Station, Illinois, 30 June 1879 letter to James T. Cobb, Salt Lake City, as quoted in Wilhelm W. Wyl (Wymental), Mormon Portraits (Salt Lake City, 1888), pp. 207–8. It would take a separate article to present all the information available on J. N. McDowell, his medical college, his museums, the sack of his museums, and the partial reorganization of his collections after the Civil War by the Academy of Science in St. Louis. For a copy of the affidavit, see Welby W. Ricks, “The Kinderhook Plates,” Improvement Era, Sept. 1962, p. 636. This excellent and detailed “Kinderhook Plate Report” is on file in the Harold B. Lee Library, Brigham Young University. Other members of the committee were Richard Anderson, William Dibble, Max Weaver, Sam Rushforth, Ronald Jackson, Reed Durham, Larry Pope, Welby Ricks, and Dean Jessee. One other topic that deserves mention is the matter of the size of the Chicago plate in comparison with a description given shortly after the plates’ “discovery.” Said the Quincy Whig article of 3 May 1843 (reprinted in the Times and Seasons article and in the Nauvoo Neighbor press broadside of June 24): “A Mr. J. Roberts, from Pike county, called upon us last Monday, with a written description of a discovery which was recently made near Kinderhook, in that county.” The article went on to describe the discovery, adding: “There were six plates﻿—four inches in length, one inch and three quarters wide at the top, and two inches and three quarters wide at the bottom, flaring out to points.” Just what J. Roberts may have had to do with the discovery is unknown (his name appears nowhere else in connection with it), but the figures he gave the Whig appear to be estimates only. For in contrast to those estimates, which come to us second-hand, the tracings in the Clayton and Brigham Young journals, as well as the broadside facsimiles, all match the Chicago plate in size. Brigham Young papers, Church Archives. I wish to thank Dean C. Jessee of the Joseph Fielding Smith Institute of Church History, Brigham Young University, for calling this item to my attention. History of the Church, 5:384. See History of the Church, 5:384ff. The original of this letter is in the John Van Cott correspondence, Church Archives. 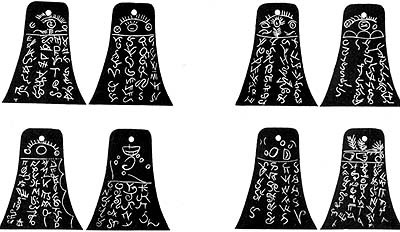 It would also take a separate article to discuss the amazing array of theories that have been put forward to explain the source or nature of the characters on the Kinderhook plates. It has been suggested at various times that they came from a Chinese tea chest, from a piece of Chinese jade jewelry, from the Lo Lo script of Yunnan, China, from Egyptian hieroglyphics, and from scripts originating in Crete, Cyprus, Sinai, Canaan, Byblos, Phoenicia, and elsewhere, including the Anthon transcript (a theory that must be discounted because no published version of the Anthon transcript was available at that time). Some have suggested that the characters derived from nothing but a lively imagination. The arrangement of the characters and the paucity of repeated signs and sign clusters does not suggest any real language. Stanley B. Kimball, professor of history at Southern Illinois University, is a high councilor in the St. Louis Missouri Stake. Enlargement of the front and back of the Kinderhook plate now owned by the Chicago Historical Society. Actual size of the bell-shaped plate is 2 7/8″ high by 2 1/4″ wide at the bottom, tapering to 1 3/16″ at the top; average thickness is 1/32″. The nickel-size splotch on the backside is likely due to corrosion since its 1843 “discovery.” Photographs courtesy Chicago Historical Society. Figure 1. A portion of one of the characters as seen in the scanning electron microscope (SEM), magnified 220 times. The irregular pock-marking typical of acid etching is clearly evident. An engraving tool would have scratch marks along the length of each groove, as well as evidence of metal being pushed from one groove into the other at intersections. Figure 2. Light micrograph of characters on the backside of the Chicago Kinderhook plate, columns 3 and 4 (magnification 7.6). Identical dents are visible at left center and right edge. Figure 3. Light micrograph of the right-hand dent of Figure 2 (magnification 50). A nick is visible at the far right on the dent. Figure 4. Light micrograph of the left-hand dent of Figure 2 (magnification 50). The nick is visible just next to the dent’s intersection with the right-hand vertical stroke. As the article shows, the dent helps prove that this plate is the actual plate seen by the Nauvoo Saints.